What some real estate sales people might not want you to notice is that Toronto prices are collapsing while in Vancouver, average detached home prices have dropped by more than 20% in the last three months. But Vancouver condos continue to climb. Question: Who woulda thunk it? Answer: Folks like Tsur who understand how the market works. According to Zolo the average same price of 2 bedroom condo is 1 million. At this post point it's into single family detached territory few years back. West, detached is gaining 3x total $ as condo, and on the East side it's detached 2x greater gain. People buy a home to live in. If you want to assess it as an investment that's your right. But it seems that those that take that approach are either renting, or severely under-housed living in tiny shoeboxes. So you have changed your mind again about a home also being an investment. I guess when prices are going up you like to claim that you made a brilliant investment but when prices are tumbling you are not interested in your home's value because you don't regard it as an investment. Hilarious! Gold is for speculators, real estate is for investors. BTW, I was not fooled by your attempted distraction technique. You continue to amaze me with your convoluted logic. You appeared to be saying that it's better to get a smaller percentage gain on a property transaction. I was pointing out the farcical nature of your understanding of basic mathematics. The fact that you prefer to buy a very old house in a scruffy distant suburb, while others opted to buy much more desirable accommodations in much more desirable neighbourhoods is irrelevant to the current discussion regarding percentage return on investment, particularly when you have previously stated so clearly that "real estate is for investors". I think I'm doing okay. Worth far more than I ever intended. Almost all homeowners In Vancouver are doing okay but, as a person who arrived late at the party, you are not doing nearly as well as the majority of Vancouver homeowners who arrived a lot earlier. Trust me, 1970's prices were much more attractive, even if the mortgage rates were much, much higher, as they probably will be again. Fortunately for you, even if we have a 1982 style crash, you are probably going to still have a little bit of equity left. Of course, if we have a 90% crash like both Tokyo and Vancouver have had before, all bets are off. Even my current primary residence would be worth much less than I paid for it in the 1980's, but being mortgage free and having multiple revenue streams provides some comfort in turbulent times. Now about what started this exchange, your lack of understanding of "percentage return" on investments. Did you make any effort to understand why a higher percentage return is better, or are you still avoiding the issue. I'm doing better than most buddy. I'd thank you for your concern if I didn't find your obsessive attention downright creepy. Still avoiding explaining your hilarious misunderstanding about return on investment eh? Allow me to correct another your many misconceptions but you apparently aren't "doing better than most". In 2006, long before you borrowed massively to join the home-owning party, over two-thirds of households were already homeowners and had been enjoying the rise in prices for years. You can be pretty sure that a high percentage of them had been paying down their mortgages for a decade or two and many had bought much nicer homes than yours in much more desirable neighbourhoods for a lot less than you paid. "I had no intention of being wealthy, believe me. All I wanted was a house for my family. When I become a millionaire because of my property it will have been completely accidental." Reality check! "Wealthy" people don't carry huge mortgages on very old, entry-level fixer-uppers in your kind of neighbourhood. If you were able to sell your home today, you would likely walk away with a substantial profit despite the stalling market, but remember that sales in your neighbourhood are lower than they've ever been in the last decade so you may have missed the peak. If you wanted to keep some profit you'd have to move somewhere even less desirable to buy another old house. 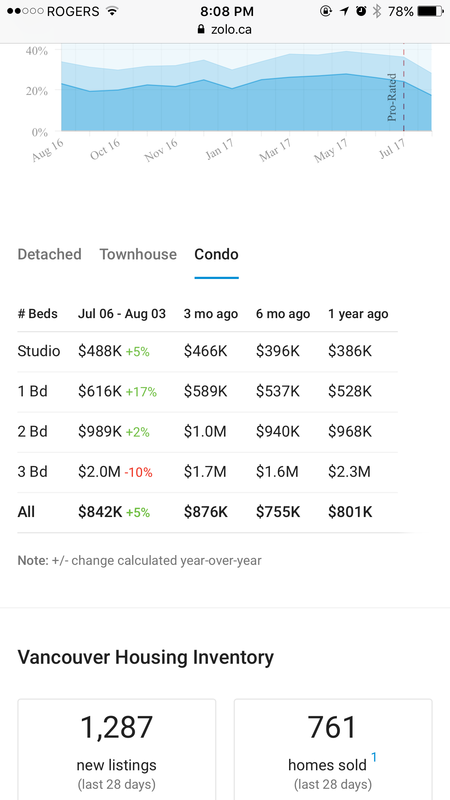 If you want to remain in the outskirts of Vancouver your situation hasn't really improved except that you currently have a good buffer for the probable impending price collapse. On the downside, the price gap between your house and nicer houses in the nice areas has widened, making any upward mobility much more difficult for you and creating a real problem for your children who may be condemned to either leaving the city or buying old stucco condos near you. Look around your neighbourhood. The majority of homeowners bought long before you and are therefore likely to be in much safer financial situations if/when prices dive. You are probably (currently) doing better than most renters in your neighbourhood but even though your area is awash with cheap rental suites, rental households are still in the minority. Hence, if you aren't even doing better than most owners in the cheap end of our city, how can you pretend to be doing better than most if we look at the City as a whole? Over two-thirds of households in 2006 reported owning the home they lived in, driving ownership rates to a record level, according to a Statistics Canada report released Wednesday. Census data from 2006 showed that of the 12.4 million households in Canada, about 8.5 million reported living in their own home. The federal agency noted that 913,000 homeowners lived in condos in 2006, an increase of 36.5 per cent from 2001.
a 90% crash likely means we got bombed by North Korea. Its almost impossible for anything crazy like that, unless Trump pushes the button....or maybe an earthquake could cause that type of devastation as well. A 50% crash would mean the economy is completely in the toilet (likely worldwide) and this would most probably effect everyone negatively not just East Van homeowners. If that scenario were to come true, Eyes is probably better off than anyone else since he has a government job and a stable pension. Even if the bank came knocking it would still be doable to keep his house I think. Also the banking system in Canada is a lot different than in the US, so if a lot of people got in trouble with their mortgages, it would be an interesting time, as the banks have to force a sale, they don't take over possession of the house like in the US...This would create a pretty negative feedback cycle and not really in the best interest of the banks. I suspect that the Feds and the banks will do everything in their power to avoid such a scenario. Given the current housing and rental crunch, I suspect any kind of weakness will open the door to investors and it will prop up the market from any serious crash. Interesting that your rant could be copied and pasted from this forum from 2006. I bought my East Van house that year and have gained 1000% in net worth since then, with at least 60-70% coming from Real Estate, not to mention about 1 million in income from my rentals. (I may do an interesting study on opportunity cost if I had stayed invested in the stock market back then instead of buying real estate). All those Fanatical bears were dead wrong then...I don't see you being right anytime soon. "a 90% crash likely means we got bombed by North Korea. Its almost impossible for anything crazy like that, unless Trump pushes the button....or maybe an earthquake could cause that type of devastation as well. A 50% crash would mean the economy is completely in the toilet (likely worldwide) and this would most probably effect everyone negatively not just East Van homeowners. All those Fanatical bears were dead wrong then...I don't see you being right anytime soon." Just a few points in response. Vancouver has had a 90% crash before and there was no earthquake. More recently Tokyo had a 90% crash too, and again no earthquake. And how about Vancouver's crash of between 40% and 50% back in the early eighties? Once again, no earthquake or nuke and the economy didn't collapse except for those who were overleveraged and lost their homes. I know ETB works for the government but I was unaware that government departments never have layoffs. Link? Also, he took on about a 600K mortgage, no big thing at 2% but a very different animal at 8% or 10%. Remember 1982 when mortgages were 22%? And if you think that home prices can't collapse while interest rates are low, look at the Tokyo collapse I mentioned earlier. It was caused by loose lending and unjustified buyer exuberance, all while interest rates were ultra-low, sound familiar? As for my "rant", couldn't be cut and pasted from 2006 because that's back when I was being called an idiotic perma-bull by Taipan. I didn't turn bearish until a few years ago. I'm glad that you have been a homeowner long enough to be relatively safe from a serious crash, just keep in mind that the effects of leverage which rewarded so many of us so generously in the upmarket years can be just a rural enemy in a down market. Leverage works both ways if are unfortunate enough to still carry a significant mortgage, that's why I almost halved my Vancouver real estate holdings and paid off all the remaining mortgages a few years ago. Sure I was too early and I Missed some additional profits but I sleep soundly, besides, I've never met anybody who was able to reliably predict peaks and troughs. I remain in the market but I'm not too worried about price crashes because I have zero leverage. FWIW, I'm not anticipating a 90% price crash this time, although I would never say it's impossible, especially with an NDP government. It does seem likely to me that a correction of somewhere between 30% and 70% is more within the range of reasonable, fundamentally based expectations. Toronto is already closing in on the lower number. Just a few points in response. Vancouver has had a 90% crash before and there was no earthquake. More recently Tokyo had a 90% crash too, and again no earthquake. And how about Vancouver's crash of between 40% and 50% back in the early eighties? Once again, no earthquake or nuke and the economy didn't collapse except for those who were overleveraged and lost their homes. Actually the crash of 1981/82 coincided with a severe global recession...also interest rates of 22% were a killer and inflation was at 12%. I believe Taipan came later, 2006 was the likes of Freako, Rentah and the gang with their crazed Bear message relentlessly stating a crash was going to be 60% or more and the market couldn't sustain current prices...blah blah blah. I don't disagree with some of your thinking and reasoning and certainly a smart move to divest some real estate holdings, I'm working on that as well, but still need a bit more time personally, and don't really want to dump some holdings that are too good to let go, but taking profits is enticing. I would say 90% is almost impossible...probably like a one in a billion chance of that happening....Something like a War or Big Earthquake would have to happen to trigger such a massive crash. Anything over 30% will be unlikely in my opinion, especially given the current housing crunch, and when will that come to pass is unknown. Toronto is playing out in a similar fashion to Vancouver after the foreign buyer tax was announced...I suspect its not quite as bad as the Average Price shows right now...but should be fun times ahead in GTO. Lastly I see many US markets are catching up to Vancouver again...Seattle sure isn't cheap these days, if you factor in the exchange rate they are probably almost on par with Vancouver.